This artifact is a single-handed hatchet from North America. General-purpose tools, they were often employed as a hand-to-hand or a thrown weapon. There is a pipe-bowl opposite to the cutting blade and a hole drilled down the center of the shaft (for smoking tobacco). 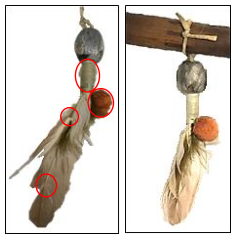 A decorative soapstone bead, group of feathers, and an orange pom-pom are held together with green yarn and attached to the stem with leather lace. Furthermore there is a band embellishment of brass tacks (metal studs) around the diameter of the haft. 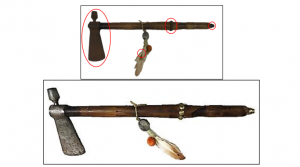 In general the iron axe-head was rusted, the brass areas, decorative string, and pom-pom were soiled, and the feather embellishments were damaged. Above top: tomahawk before treatment; encircled were the main treatment areas. Above below: tomahawk after treatment. Importantly, the rachis of one feather had split apart, and the feather was held together only by the integrity of the barbs. Therefore the main conservation technique involved a modified form of the veterinary treatment imping: implanting a splint inside the rachis of the feather to repair it. 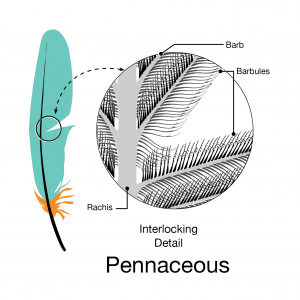 Above: anatomy of a feather showing the rachis and barbs. Image courtesy of The Cornell Lab, Bird Academy. Above left: decorative detail before treatment; encircled were the main treatment areas. Above right: decorative detail after treatment. This treatment, along with careful, specialized cleaning revitalized the tomahawk and revealed some unique characteristics. For instance, an unusual pattern of circles was uncovered on the axe head which was previously obscured by rust and a possible maker’s mark was uncovered on the pipe bowl which could provide more diagnostic information in the future.?? Aside: Fleming College conservation intern Jazmin Beddard performing controlled cleaning. Image courtesy of Marie Hoffmann. Treatment Images provided by Jazmin Beddard. I loved reading this article! The before and after photos, and especially the details about imping, made the process of treating artifacts sound interesting and valuable. The Pipe Tomahawk looks beautiful! Well done! Thank you for the wonderful comments – we will pass these along to Jazmin. 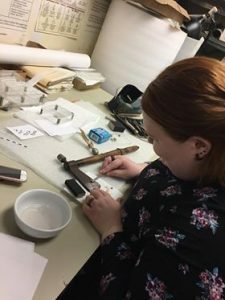 Our internships provide practical, hands-on experience in a museum setting – but we are also fortunate to benefit from some excellent skill-sets shared by these students in the early stages of their professional careers!